The Great Divide Ride is coming up this Sunday 25 March. The ride will be a good-natured protest highlighting the issue of the division and impermeability of the boroughs of Barnet and Brent for cycling because of the North Circular Road. Particularly it will be highlighting the rebuild of Henly's Corner by TfL last year, which made it much more dangerous for cyclists. The policy TfL carried into operation at Henly's Corner is the same single-minded prioritisation of motor traffic flow above all other considerations, especially pedestrian and cyclists safety and convenience, that is evidenced also in their recent changes at Blackfriars, and coming up at Kings Cross. We can expect more of this, at more junctions all over London, unless we can make them see that a large number of Londoners are not happy with this agenda. If you have any doubt about the issues around the North Circular, Barnet LCC have made this brilliant video showing just what the protest is about, including what it is like to cycle at Henly's Corner and Staples Corner. See also the letter to the mayoral candidates asking them for their views on the issue. 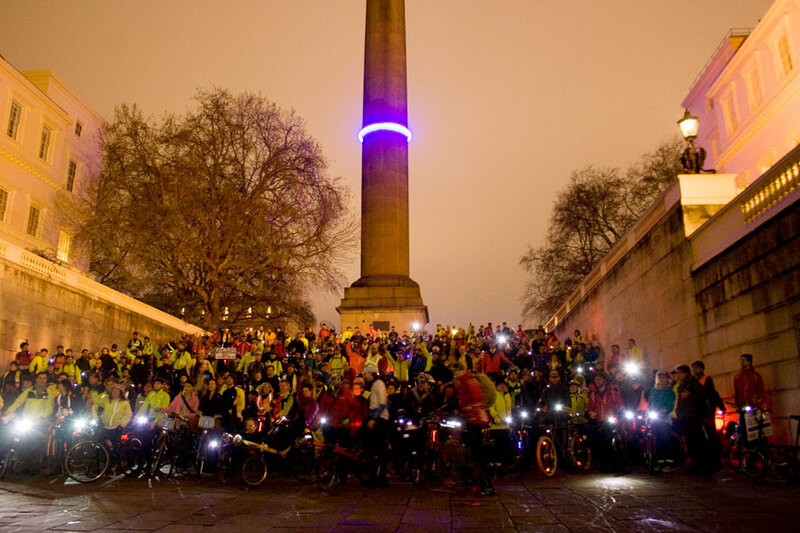 Though primarily a north London event, we expect to be joined by cyclists from all over London. It should be quite a carnival, and, with a large group, which will be thoroughly marshalled, negotiating some of the worst junctions in London should be easy even for children (who are welcome to come if they are up for something like a 20 mile round trip from Brent). We expect media and quite a bit of publicity. The ride ties in both with The Times's Cities Fit for Cycling campaign (which is calling for redesign of Britain's most dangerous junctions) and LCC's Love London, Go Dutch campaign, which is calling for London's streets to be "as safe and inviting for cycling as they are in Holland". 1) Start 9:00 am from the forecourt of The Crown pub, Cricklewood Broadway. Ride will be led by Mustafa Arif (mob. 7966 924728). 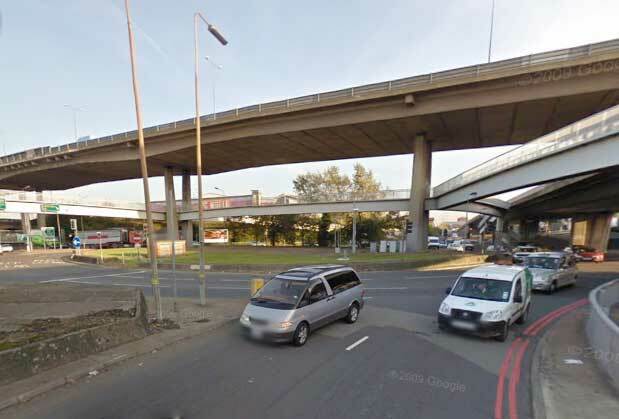 After uniting at New Southgate we will head back west, crossing the North Circular about 10 times, finishing around lunchtime with a picnic at the "secret park" in the centre of Staples Corner (no, I've never been there either). So get your picnic together, and I hope to see you there. The Great Divide Ride will allow you to cycle safely with your children through junctions like Staples Corner West. Take the opportunity: it could be a once-only occurrence. I have not yet reported on the 22 February protest ride organised by ibikelondon, Cyclists in the City and the London Cycling Campaign, in advance of the Commons debate on cycle safety inspired by The Times's Cities fit for Cycling Campaign. Well the ride was a huge success – as we knew it would be. Cyclists, for the first time in my 26 years of riding in London, are now prepared to stand up (or sit in the saddle) and be counted, and are not prepared to let the status quo continue. I arrived at the top of Duke of York steps to see a picturesque sea of winking red lights from the throng of riders gathered below on The Mall. There were clearly hundreds here, though all of them were not in view. The ride took off, and wound its way very slowly down The Mall and into Horse Guards Road, then headed for Parliament Square, turning right at the Palace of Westminster, down Millbank, across Lambeth Bridge, then back along the south side of the river to Westminster Bridge, across the bridge, past St Stephen's Tower (Big Ben) and up Whitehall, to Trafalgar Square, and back to The Mall. Police on bikes did an excellent job of keeping impatient motorists, taxi drivers and motorcyclists at bay, and of minimising conflict, and the LCC marshals also did a sterling job in keeping the ride together. The police estimate was that 2000 cyclists took part. This is a similar number to that on the last Blackfriars flashride, but this ride felt symbolically and emotionally far better, and just more like an important historic moment. It was a protest ride in the right place, winding round the centres of power, Westminster and Whitehall. It was enthusiastic and noisy (previous flashrides had been quite quiet). It included MPs, London Assembly members and councillors. It was a ride riding a national wave of publicity and concern over the issue. Everybody on it, from "almost never cycle" people on bikes in their ordinary clothes, to long-distance touring cyclists and road racers in their usual get-up, knew why they were there and what they wanted, united in pushing the messages that cycling needs to be made safe, and that the way to make it safe is to build "cities fit for cycling". No more victim-blaming, no more persecution, no more putting the burden of taking all the protective measures on to the cyclists, no more letting motorists get away, literally, with murder, no more road designs that ignore cyclists – the slogan Cities fit for cycling encapsulates the point: it is the environment and the law which need changing, not the people on the bikes. The point was made, and made to people who matter, as subsequent events proved. It felt like a turning-point. had already galvanised the debate. There was mercifully little of the traditional UK pantomime of "cyclists should do more to protect themselves" and none of the equally-traditional comedy number "cyclists must get their own house in order and obey the law before we spend money on them" (when was that argument ever used against any other social group?). The MPs here basically understood the agenda that The Times has been driving home: our streets on which cyclists have to ride are not fit for purpose. And they, broadly, recognised that fixing the situation was going to cost a good deal of money, and take much time and political determination. There was also a recognition we has been here before – the National Cycling Strategy of of 1996 had aimed for 10% of trips to be done by bike by this year, 2012 – and a feeling that the same failure must be avoided, at all costs, this time around. I do not expect that a greater number of cyclists will on its own result in a risk reduction for the cyclist....Policy that only focuses on an increase in cycling and at the same time ignores the construction of more cycling facilities will not have a positive effect on road safety. Cycle training can help a few nervous but keen individuals to cycle in a hostile environment. However, it's not something which scales to support the entire population in cycling for a significant proportion of all journeys. Talk of "safety in numbers" just distracts attention from the real, hard-engineering measures that are needed to create mass cycling in an advanced industrialised nation. As I say, it just confuses the debate, and it did indeed confuse some MPs' advocacy of the cycling cause in the debate. It is an idea we need to move beyond. Then there was the "strict liability for drivers" issue, another thing where there is a bit of a correlation with high cycling levels in various countries, but we get the causation, again, the wrong way round in this country. Driver liability is an insurance technicality, legal small-print, if you will, which really cannot affect people's real-world, moment-to-moment decision making on the roads. It can have little effect on safety. It was introduced in the Netherlands after they already had mass cycling based on good infrastructure. It came as a consequence of that. It doesn't itself create, or significantly contribute to, mass cycling, anywhere. It's another distraction. Then there was the minor distraction raised of "the need for showers and workplace lockers" – whereas a characteristic of mass cycling based on good infrastructure is that it is relaxed, not fast and furious, and people dress for their destination, not for their mode of transportation. These things again should be seen as largely irrelevant to what we are trying to achieve. Then again, there was a lot of mixing up of cycle sport with "cycling as transport" in the debate. Unfortunately, because the one word "cycling" in English covers both of these quite different and largely unrelated areas, this usually happens. (The Dutch have two different words.) This was all the more understandable in view of the impending Olympic Games, and I do not entirely discount the possibility that some people may be inspired to start cycling, either for leisure or utility, as a result of media focus on the sport, and I recognise this to be a good thing. But unless we follow up this burst of enthusiasm with real change on our roads, to make people continue to cycle, by making it a pleasurable experience for them to do so, we will be back to how we were within a year or two. So: cycle sport, nothing wrong with it, but not really the issue here. So there were these bits of foolishness and confusion in the debate. But overwhelmingly it was on the right lines. There was a huge amount of concern by MPs at avoidable deaths and injuries of their constituents while cycling, and a recognition we have both to physically put our roads right, and get prosecution and sentencing of road traffic offenders right. Ian Austin talked memorably about "the derisory sentences drivers [who kill] receive". Julian Huppert came down to the hard facts of the case when he said that "£10 per person per year is needed to turn Britain into a prime cycling nation". Ben Bradshaw, a Labour ex-minister who has been involved with cycling at the parliamentary level for many years, noted, from his experience of government, how getting action on cycling tended to be dogged by two things: firstly, a failure of the different government departments that need to be involved – treasury, transport, environment and local government, and health – to collaborate, with what he described as conflicting cultures between the departments, and, secondly, the presence of so many disparate voices from the cycling lobby. This last certainly has been a problem in the past, but my sense now is that cyclists are far more united now in calling for the measures that really increase safety and cycling numbers. I think the flashrides have been evidence of this. MPs merely having this debate doesn't actually get anything done. Cyclists, and The Times, still do not have any of what they are asking for. Delivering those is down to the Prime Minister, who knows that cycling in the UK involves "taking your life into your hands', and his senior ministers, particularly the Chancellor, and the Secretary of State for Transport. There was nobody at the debate who could deliver for the government. Under Secretary of State for Transport Norman Baker was really the fall-guy for this debate: he was in clear, and embarrassing, difficulty, trying to justify the record of the coalition so far – that of his government, that had abolished the already meanly-funded Cycling England quango and not replaced it with anything coherent, and which had nothing to offer but £11 million per year for training cyclists in techniques to avoid getting squashed on the roads by negligent drivers and lorries that shouldn't be there in the first place, and a Local Sustainable Transport Fund that mixes £15 million for a paltry few cycling schemes of questionable quality with far too much other stuff. Everybody, including him, seemed to know that this is just not action on a scale that is going to work. He candidly revealed his "envy" for the "fantastic" cycling environments in Amsterdam and elsewhere in the Netherlands. He knows that they achieved it by spending about 80 times his total expenditure, per person per year, for forty years. He knows what is needed, but can't yet deliver it. So the onus remains on cyclists, and their supporters in the media and politics, to keep pushing to put cycling's supporters in the government, like Norman Baker, (and maybe David Cameron himself?) in a position where they can deliver what is needed. 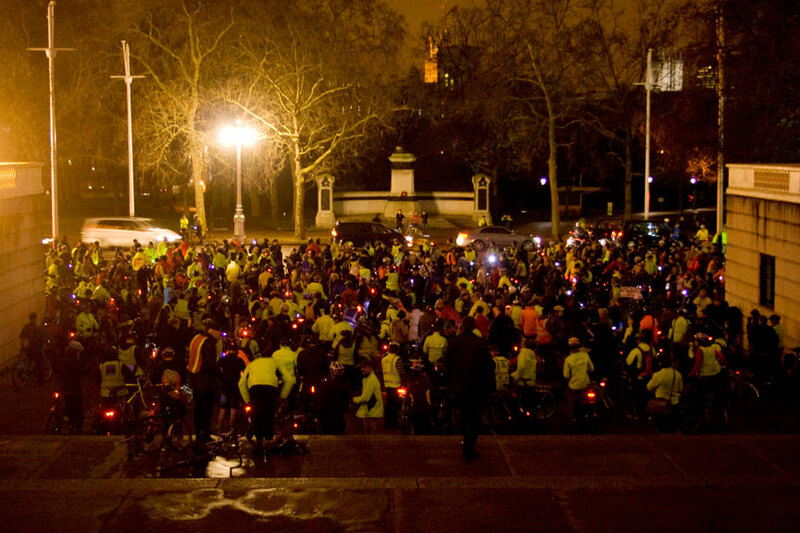 In the London Cycling Campaign, our next step, apart from the Go Dutch petition, will be a protest ride on 28 April, which should be the biggest ever. If you can possibly get to central London to take part in this, wherever you live, start planning to attend now, please. If you don't live within cycling range, there are always trains, coaches (and, dare I say, cars), and Boris bikes at the London end! There remains much to do, and we are not close yet to getting the demands of even The Times's too-modest manifesto. Nevertheless I think the national debate has decisively changed. If this were a war, this would not be the Beginning of the End, but I think it could be the End of the Beginning. I'll finish by going back to the start of the Westminster flashride. I arrived at the top of Duke of York Steps. As I took photos from the top of the steps, many pedestrian passers-by, all types of people, asked me what was going on. It was difficult to explain quickly, but I told them it was a peaceful protest to highlight to MPs the need for better safety for cyclists. Everybody I spoke to was 100% in favour of the protest when I told them this. All agreed that this protest was a great thing to happen, even if it did get in their way temporarily. These people were not cyclists. These reactions, more than anything else, lead me to think that a rubicon was passed on the night of 22 February 2012. The vast ship of public indifference to cycling safety and cycling conditions in the UK, that campaigners have been pushing and shoving at for decades, getting nowhere, had started moving. Almost imperceptibly, over the winter of 2011–12, it had started to slide down the slipway into the river. The Times campaign had given it a welcome shove, but their effort was dependent on those of many others who had toiled away long before. The ship may yet stick temporarily, and may require many more a hard shove, but I have no doubt it will enter the water, now that it has started moving. In the bar afterwards we toasted the moment. The Vole celebrated with tea.